Nearly every activity you perform over the course of the day relies on your sight in some way, which is why eye injuries can be physically and emotionally devastating. If you've suffered eye injuries in a car accident caused by someone else's negligence, you are entitled to compensation via a personal injury claim. Contrary to popular belief, airbags do not contain air. They are filled with nitrogen gas and various other chemicals. This makeup, combined with the force at which they deploy, can cause eye injuries in the process of preventing other forms of accident-related trauma. A traumatic brain injury (TBI) from a car accident can lead to a number of vision problems, including binocular dysfunction, spatial perceptual deficits, and loss of visual acuity. This is often due to damage to the optic nerve. Dirt, glass, and debris from the vehicle are sent flying when an accident occurs. If these particles get into the eye, they can cause corneal abrasions and/or lacerations. 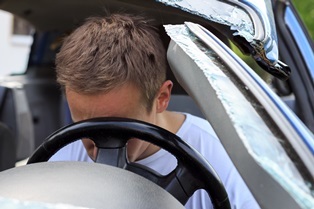 Blunt trauma related to a car accident can cause the eye to bleed or rupture. When this happens, the eye may need to be removed and replaced with a prosthetic. The socket surrounding the eye is known as the orbital bone. With enough force, this bone can fracture. If shards of bone are forced into the eye or brain, vision loss can occur. While not common, car accident victims can suffer chemical burns if the eye comes into contact with harmful substances such as household cleaners with bleach or ammonia, pool chlorination products, or other hazardous materials being transported in the vehicle. Prompt medical attention can prevent some complications from eye injuries, but some degree of vision loss may occur following a severe car accident. A personal injury claim is a civil suit that can be filed in addition to any criminal charges related to the accident that caused your injuries. Louisiana law gives you one year from the date of the accident to file your claim. You are still eligible to file a personal injury claim if you were partially at fault for the accident that caused your injuries. However, Louisiana's pure comparative negligence law requires that your settlement be proportionally reduced by your assigned percentage of fault. Even though the majority of personal injury cases are settled out of court, hiring an attorney to represent your interests throughout the process is the best way to protect your right to compensation. Without an advocate, you risk being pressured into accepting a settlement that doesn't fairly compensate you for the harm you have suffered. Your attorney can gather evidence to prove liability, document damages, and negotiate on your behalf for maximum compensation. This may include finding relevant expert witnesses to quantify the effect vision loss has had on your daily life.